Entering data manually into any CRM app is not fun. Any solution that helps automate data entry is a win for CRM users. That is the idea behind our new mobile app for Zoho CRM – Card Scanner. Card Scanner is an iPhone app that extracts contact information from business cards and saves it into Zoho CRM as Contacts or Leads. 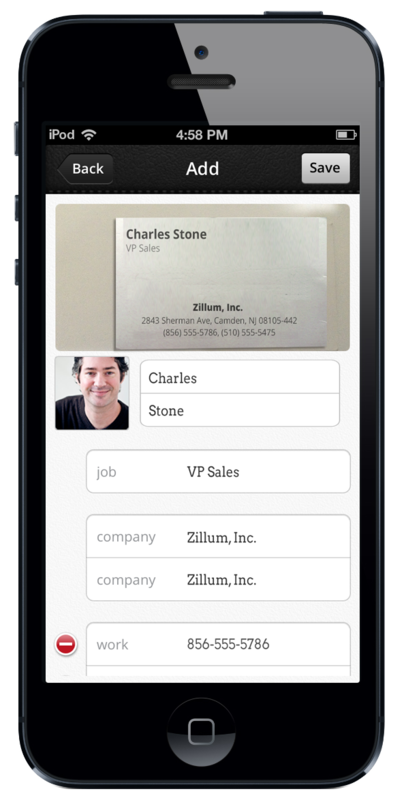 Take a photo of a business card and the app extracts information from it and automatically populates the information into the appropriate fields. You can save the extracted information as a CRM Contact or Lead if you are logged into your Zoho CRM account within the app. The app can extract information from business cards in multiple languages including English (US & UK), French, German and Spanish. If the extraction includes the Twitter handle, it automatically downloads the photo from the public Twitter profile and syncs it with CRM. When the contact information is saved in CRM, the photo of the business card is automatically attached to the contact or lead record in CRM for future reference. Extracting data through OCR can be tricky. It cannot always be 100% accurate. We think we built the app that tries to be as accurate as possible. But given the number of variables (poor lighting conditions, multiple photo angles, complex logos etc) that could impact the quality of data extraction, we try to make it easy to display the accuracy factor in the extract within the app. In cases where we are not too confident about the extracted information, we display that information in red. This allows you to easily correct any possible inaccuracies before saving the information. 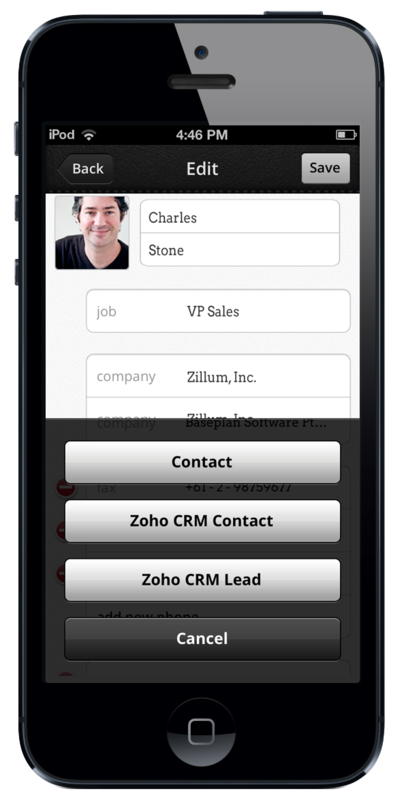 We think this will be a great complementary app that will simplify the data entry process into your CRM system. The app is currently available for the iPhone and Android. More about the app here. We hope to hear your feedback. Would the OCR open up to Zoho creator? I think this will be useful when the requirements need to read on the object (business card, textbook) instead of user manual input into the fields in zoho app. want to scan 4 lacks cards.want application desktop base.It can read data from tiff images which i scanned on adf scanner like fujitsu6125. I agree with James about the free trial. There is a free trial for Andrioid phones (let’s you scan 10 cards with the in up purchase for more) but there isn’t one for Apple. Also, as for the adnroid trial app, it would be nice to have an option of adding a card to leads or contact, for now it only adds them to leads. Any version for Windows Phone? Or any other smiliar app on Windows phone which works with Zoho? I would happily pay the $5 for the Android version. How long until launch? Please mail us at isupport@zohocorp.com in case of any issues. can you have one for android phone cos I will love to use it also. Looking for Android app… Any new on when??? Is it heavy duty? because I have before this one but it did not last long. Any new about Android support?? Any new about Android support? It is a must for this app to differentiate the type of phone number as mobile, fax, work,etc. Considering all numbers as work, demerits the use of this app.Delaying this issue for a new release compromise your app success. This problem needs to be fixed Right Now! Your app also requires correct synchronization with all the fields in the Zoho CRM platform. +1!! !We android users need this desperately! Been testing this app today and really like it. The only item I saw as problematic so far was to change the telephone settings “work”, “mobile”, etc. It is reading all of them as work. Perhaps this is something to look into? Can you outline the differences between your new iPhone apps “Leads” and “Business Card Scanner”? They look like they overlap quite a bit. But I can’t tell from the descriptions whether “Leads” will let you enter the data as Zoho Contacts/Accounts, and whether “Business Card Scanner will let you scan QR codes or connect the newly entered records into campaigns. I love the concepts for both; but would really rather only buy one app that does the full job instead of two – and then have to figure out which one to use each time. I just purchased the iPhone app and it works very well. My only complaint would be that it does not allow you to select a company name from the Zoho Database to automatically attach the Contact to. Even if the Account Name is correct, it just puts that info in the Description field. Even with this deficiency, it still saves loads of time. I just keep this app and the Zoho CRM iPhone app open at the same time, and once I scan the contact and save to Zoho CRM, I then open the Zoho CRM app, find the contact, and add them to the correct Account. The Scanning is pretty accurate, but if it doesn’t work the first time, rescan and it usually gets it the second time. Ditto! I use Linked-In and Facebook for digital networking, best believe the thousands of mom and pops, smaller enterprises, distributors, dealers, and face-to-face networking in general that we transfer to our CRM database still THRIVE on CARDS! Especially at trade-shows! I too was loving CardMunch till I found not so easy to get data out to my CRM/Mailchimp, etc. so I downloaded ScanBizCards. Zoho Biz Card Scanner app is NOT A GIMMICK but crucial to streamline our sales and tech support processes across our team. Using Cloud integration to automatically sync WufooForms/MailChimpCampaigns/ZohoCRM, thinking of adding Zoho Support as our cloud based Help Desk! Keep improving, Zoho! When will be this app available at Android? does it really not work? i was thinking about downloading today. Just downloaded the iPhone version and it works well. I especially like the interface. The only thing that didn’t work as expected was the “add to twitter”. The card I scanned had an “@username” but it didn’t pick that up. Is it specifically looking for the word “Twitter” to map this field? I also agree with the users commending the one-time fee as opposed to ongoing charges. Im sure the Android app is coming. I eagerly look for updates daily. Whoever thinks that business cards are no longer valid obviously dont network with real live people the way I do. Its a cardfest out there!! As a newbie to Zoho, I personally find the whole system to be great in theory. Ive yet to integrate and customise however so the jury is out. It was good enough for me to sack my previous crm and I went wow more than once or twice. Keep the apps coming. Android would certainly be welcome. Hi just purchased and does not work. Will be fantastic if it does. Android app soon, please! A trial sounds good as well. Love this idea. Any word of how long before you have an android version of the app? Thanks! Maybe I’m desensitized on buying apps, but the price seems right, and I would rather pay once than monthly. This is an awesome tool, but what about ANDROID???? Don’t have an iphone and will never have one. Business card scanning; really? What year is this? We hardly ever exchange business cards anymore. Default is LinkedIN linking. So I don’t consider this a useful “innovation”. I much rahter have you guys focus on improving your core product. E.g: more inpage field updates with automatic save. (instead of opening a field (edit) entering data en saving it). This would improve daily productivity dramatically. Which is, as a bussiness owner, how I valuate our business productivity tools . So I suggest focus on getting your User Experience right before adding more ‘gimmicks’.I am convinced these features dont get you customers (when they evaluate your CRM) and most certainly wont keep them! Please stay focussed! Diego,It does support scanning business cards in Spanish along with French and German. This should be a free app as providing a BC scanning capability just adds to the benefits of Zoho CRM. There are already free BC scanners that export to SalesForce, Evernote, Jigsaw and more. 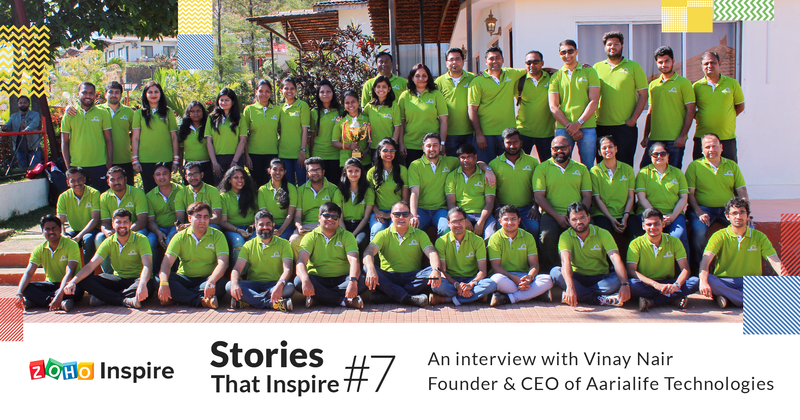 Zoho should stay competitive by offering similar functionality. Does it supports any other language than English? For example Spanish? If so, could you please let me know. This sounds like a great tool. Bruno,Please note that this is a one time payment of $4.99 and not recurring. This includes all future updates on iOS. Richard,We will try to support Dutch language in our next version. Tim,The team will get in touch with you. Just purchased app and it will not work…please have someone email me to help. Seems like a very useful tool for me, except the fact that I need Dutch language. If this was in Dutch language available I would buy it immediately as I’m a happy ZOHO CRM customer (in Dutch as well) :-)When will Dutch language be available…..? Anyone know if there is a substitute app that could also work for Android? allready possible with business cardreader. Awesome ! Many of our customers were asking for this. We all know that OCR technology can be pretty tricky but it seems you guys have done great work on this app. Thanks a lot 🙂 . I’m at a loss…and waiting. Great. So what about us Android users? A lite version with limited scans would be great to trial – as they say, OCR is a tricky process and if the app doesn’t do it well I would like to know before buying yet another business card scanning app that is more cumbersome than it is worth.